You are here: Home » MEDIA » Black Mirror… on the wall, who’s the freakiest of them all? Black Mirror… on the wall, who’s the freakiest of them all? 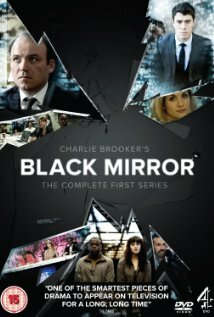 Another helping of the near-future TV scifi series from Charlie Brooker, Black Mirror, is coming soon (UK, Channel 4)… In a dark cyberpunk future, Brooker aims to tap into our collective unease about the modern world… but is that a good thing? Not when the technology goes wrong, it blooming ain’t! Black mirror, mirror on the wall. Weird City (scifi TV series trailer). Black Mirror season 4 (trailer). « Intrusion by Ken MacLeod (book review).